While there’s a lot of summer steelhead in the Rogue our fall Chinook season is already going gangbusters. These salmon started coming into the Grant’s Pass area in August and we’ll have more fish enter the system daily through October, even though they close salmon fishing in this area at the end of September. However, in October salmon fishing continues as long as you fish below Hog Creek. There’s no prediction on the Rogue like we have on the Columbia. To be honest they always predict a massive run and it always peters out. The last few years it’s been fair, but this year should be substantially better. The fish had plenty of water to get up here in August and there’s more fish now than there was last year. It’s better than what I was expecting. This year’s fish have been in excellent condition. Our water has cooled down and they are now dropping the water so these fish are going to start to keg in the holes. They started off a little small, averaging 12-20 pounds, but now we are starting to see some larger fish that are running 20-35 pounds. You can currently find salmon from the town of Rogue River all the way to down to Galice Creek, which is roughly 40 miles. If you are fishing anywhere in this stretch you’ll find salmon in water that’s anywhere from six to 15 feet deep. You can also find them in the tops of rapids, tailouts and in deeper pools. Sometimes, you’ll find them along shelves in four to 10 feet of water, which is a good back bouncing area. 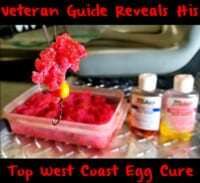 My favorite technique is back bouncing Red Fire Cure roe. There’s no better method here, but keep in mind, the squawfish are out of control and if you simply use a glob of roe they are going to rob you. It’s important, for at least the rest of the salmon season, to fish them in sacks or you’re going to struggle. I’m running 65-pound Tuf Line braid and a 30-pound Maxima Ultragreen leader with a Owner 3/0 hook. While it depends on what hole we are fishing I’m using 1.5 to 6 ounces of lead. And, one thing that’s been interesting this year is we’ve caught more fish just in front of the boat than I have 30 feet out. People think you need to get away from the boat, but sometimes they are underneath you so cover every inch. Not everyone wants to fish roe. 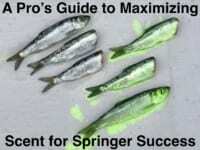 Those that don’t employ K-15 or 16 Kwikfish with a Fire Brined or Fire Cure sardine wrap. You want the wrap to have more juice and to be firmer. Remember these fish smell in parts per billion. Anything that helps get your scent off that lure is huge. Editor’s Note: Anglers may keep two wild Chinook a day. There are no hatchery Chinook on the Middle Rogue. You can, however, keep two hatchery steelhead per day, but they must be 24 inches long. This is a combination limit. You can have a total of two Chinook, or two hatchery steelhead or one of each. The Middle Rogue closes to salmon fishing at the end of September. For more information on Fishing with Troy’s fall Middle Rogue salmon drift boat trips please call 541-761-0015.